We now know with certainty that astrology was taught in the finest European universities, in Italy and elsewhere, from the middle of the 13th through at least the middle of the 17th century. A central and integrating feature of the curriculum, astrology was taught in different respects in three distinct scientific disciplines: mathematics, natural philosophy and medicine. It was also practiced throughout medieval, Renaissance and early modern European society at both university and court, including at the highest levels of politics and culture. How and why, then, was astrology deleted from this cultural and scientific centrality? In this talk, I will explore one piece of this puzzle, namely, the removal of astrology from its normal teaching in the mathematics course in the writings of Christoph Clavius (1538–1612), the influential educational theorist and textbook writer for the increasingly successful and international Society of Jesus, more popularly known as the Jesuits. In the philosophical debates carried out by Renaissance physicians, Galen’s theory of the soul became one of the most important issues because his newly recovered texts, such as De formatione foetuum, contained crucial elements that were not reconcilable with the medieval understanding of Galen’s theory. These ideas then had to be verified according to a conception of the soul based on Aristotle’s teachings and Christian dogma. This paper examines the case of a debate between Italian humanist Nicolò Leoniceno (1428–1524) and humanistically trained French physician Jean Fernel (1497–1558) on Galen’s theory of the soul. The problem of the human soul’s immortality played a significant role in the development of their divergent interpretations. The Peasants’ War of 1525 profoundly impacted Protestant reformer Philip Melanchthon’s concept of social order. Moving away from his earlier commitment to the Platonic ideal of social equality, he conceptualized both theologically and philosophically the eternal order between the ruler and the ruled, territorial princes and peasants. By closely examining Melanchthon’s Confutatio articulorum rusticanorum (1525) and his 24 theses on the Peasants’ War, Disputatio de iusticia carnali et civili (1525), a new light is shed on the theological background of his commentaries and summary of Aristotle’s Ethics, published since the late 1520s. By analyzing Melanchthon’s adaptation of the Aristotelian concept of distributive justice, this paper elucidates the need for sixteenth-century Protestant thought in general and of Melanchthon in particular to ideologically establish the concept of divinely sanctioned social order so as to prevent future occurrences of such catastrophic events as the Peasants’ War. Francis Bacon reveals the view on mythologies in De sapientia veterum that myths are not fantastic tales fabricated by the ancients, but intrinsically “religious” accounts with mysterious origins. Since allegories and metaphors placed in myths are veils intended for humans to uncover hidden meanings, he claims that myths provide a means for humans to communicate with deities. This communicative nature of myths will be the focus of this presentation, as I illustrate Bacon’s theology as well as his unique interpretation of the Promethean myth, which for him signified the centrality of humans in this world, and their need for advancement. Such justification of his philosophy will be examined in reference to his theory on imagination. While he was critical about excessive reliance on imagination in religious matters, he evaluates it as a powerful epistemic force that could sometimes topple the governance of reason. Christianity was introduced in Japan by the Jesuit Francis Xavier in 1549. Upon his arrival, he was struck to learn that the local Buddhist monks denied the possibility of life after death. For his evangelical activity, Xavier opted to emphasize the doctrine of the immortality of the soul, which was determined as an article of faith at the Fifth Lateran Council (1513). The Jesuits who followed him, until Alessandro Valignano, continued to work in this direction. While Europe saw lively debates on the doctrine of the immortality of the soul among religious orders and leading philosophers during the Renaissance, disputes on the same issue between the Jesuits and the Japanese Buddhists show a striking parallel. This paper identifies the afterlife (or absence thereof) as the most important issue in Japan’s Christian Century and addresses the country’s religious and cultural encounter with the West. 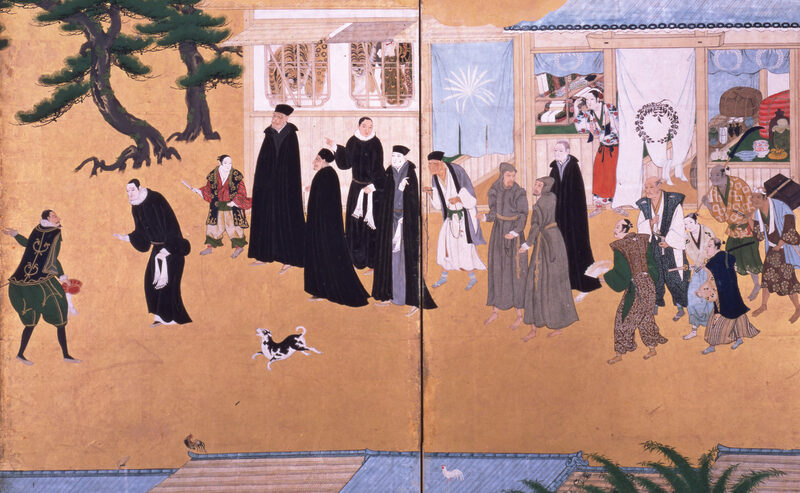 Jesuit missionaries introduced Western cosmology in Japan during the sixteenth century as a dialectical and strategic weapon in their conversion plan. Despite the severe persecution begun in 1614, their cosmological manuscripts survived and were transmitted, whereas Christian content was entirely cleansed. In the 18th century, some readers even reached the conclusion that they were not of Western origin, and others considered them as having Chinese roots. Moreover, an interesting interaction with specialists of Dutch texts took place at the end of the same century. Jesuit cosmology was thus preserved throughout the Edo period by way of a complex process in which Chinese and Dutch specialists intervened. This paper examines how early Jesuit cosmology in Japan was established, preserved and transformed. Studies on the Japanese reception of Western medicine often focus on Luis de Almeida’s missionary hospital in Funai (1557–87) and some aspects of “Southern-Barbarian-style surgery” as the country’s first response to Portuguese and Spanish influence. This paper revisits the circumstances under which this encounter occurred and the extent of its impact on practice and writings. Indeed the exchange of know-how was fairly balanced, in contrast to later centuries. While inducing a particular view of European medicine in Japan, this encounter during Japan’s “Christian Century” also stimulated Western observations of the Sino-Japanese system (pulse diagnosis, acupuncture, moxibustion, etc.). Although “Southern-Barbarian-style surgery” never achieved the status of a clear-cut paradigm like Western medicine, it provided the basis for the ready acceptance of “Red-Head-style surgery” after the Dutch East India Company moved its trading post to Nagasaki in 1640–41.